The capital crunch it’s called. Small businesses in search of financing for improvements and investment are being turned away by both traditional and non-traditional lenders. Our story about Pittsburgh’s Bar Marco was a case in point. Months of pitching and searching for financing fell flat, and a now successful neighborhood institution almost never was. In many communities, this scenario plays out dozens of times. In the process, small businesses suffer and struggle to meet client expectations, ironically putting them at greater risk for failure. Recently, financing options have expanded with the additional of crowd-source financing – a way for businesses to raise funds for improvements through an on-line platform that allows the business to make direct appeals to customers and potential investors. Kick-starter is one such program making waves among artists, etc. (We’ll cover our friends at Bar Marco and their Kick-Starter project in the forth and final of Bar Marco Small Business Series). Yet for non food-related small businesses, Kick-starter policy precludes them from using the on-line platform. 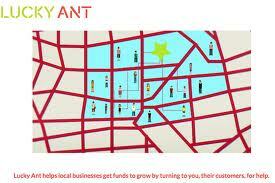 Lucky Ant approaches businesses in targeted neighborhoods. A commercial district managers dream! Lucky Ant has helped seed investment in a slew of small businesses. We recently met with Lucky Ant’s Jonathan Moyal and Nate Echeverria to talk about their expansion plans. They are now based in New York and have opened two neighborhoods, Williamsburg and the Lower East Side (in coordination with the Lower East Side Business Improvement District). Local businesses are now lining up to join the pipeline in both of these communities – raising funds for things like website upgrades, new facades and signage, and equipment upgrades. Nate, an urban planner by training, inherently understands the value of place based work, and he reached out to us to discuss ways to partner with Commercial District Entities (CDEs) as they look to open new neighborhoods. We were more than happy to oblige! We think partnerships with CDEs make loads of sense, and are excited to see their idea quickly picking up steam. CDEs are so perfectly positioned to identify businesses that can benefit from this kind of financing, as well as help spread the word among constituents about the service, driving donations and building community at the same time. In follow up conversations with a local BID Directors, he immediately thought of a long-neglected theatre-marquee whose upgrade would make a powerful statement about the district – not to mention help attract more visitors to this important entertainment anchor. This is exactly the kind of idea that Lucky Ant hopes to seed! Here’s a fun video that describes how Lucky Ant works…enjoy! There is also smallknot, another community crowdfunding source with a loan payback structure. I believe these organizations will soon begin to challenge the community banks and microfinance institutions, as the go to lending sources.